Anima sola (also called Espiritu Intranquilo-Intranquil Spirit) was a woman named Celestine. She was a water bearer that refused to give water to Jesus during his crucifixion and gave water to the other two thieves. She was then cursed to serve others for eternity due to her unkindness. She is very miraculous spirit, granting a wide variety of favors to those who ask, specially when it comes to work against others. While some folks see her as a vengeful spirit, she is a spirit that humanity find their own truth, humility, and divinity. She enhances our workings by clarifying our lines of communication. As any spirit, she must be left an offering for her services. The usual offering is light (candles or lamp) for a few days. Any color will do, I have found her to have no preference. You can petition her to help you on your work, or pray to her and have her do it all on her own, just be clear and remember to pay her. 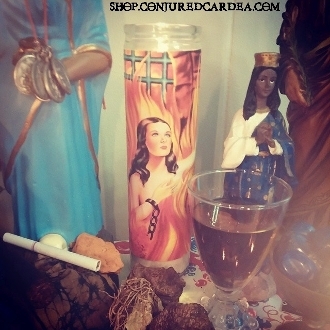 This listing is for one novena prayer candle and my Anima Sola Sacred Image oil. Abandoned in this obscure dwelling. Is returned to me or appears. O Soul, the most abandoned and alone of all of purgatory!